Where to begin? Where to even start? Should we begin by talking about the way Strava will make you feel? Off the top of my head here are a few of the feelings I've experienced: pride, humility, disgust, motivation and even jubilation. I would like to think those that are already enjoying the love\hate relationship with Strava are experiencing similar emotions with this new Cycling/Running tool. I often find myself uploading data from my rides before I even shower. Red Rider doesn't appreciate this habit. But this shows the priority that this new tool offers. OOPS Special add on to Strava for Free at the Bottom of this POST !!! Strava grew out of our own needs as athletes. With busy lives requiring much solo training, we missed the sense of camaraderie and friendly competition that drove us to achieve our best through training with others. 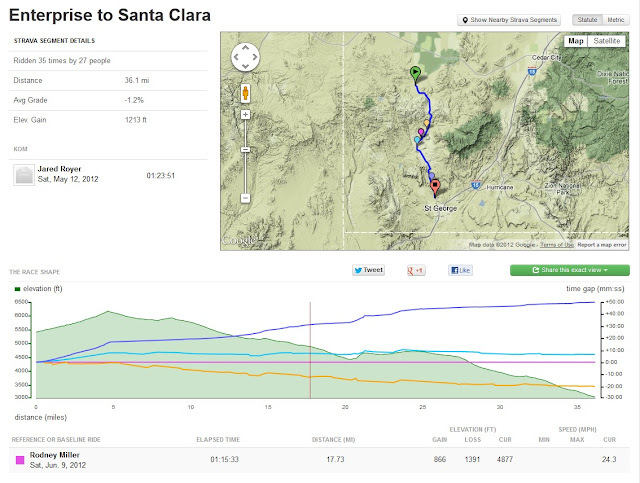 We envisioned Strava as the means to put our workouts and races into context. We call that social fitness. 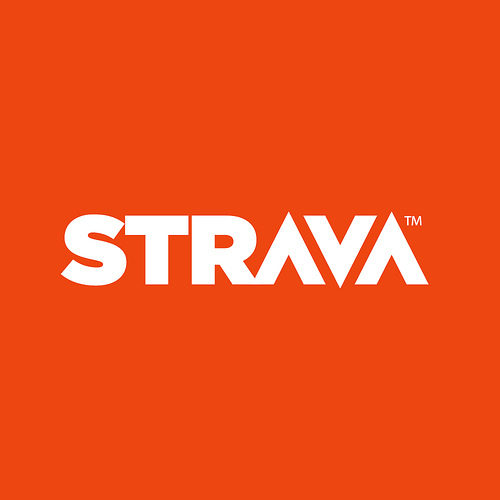 Today, Strava lets athletes all over the world experience social fitness—sharing, comparing and competing with each other's personal fitness data via mobile and online apps. Currently focused on the needs of avid cyclists and runners, Strava lets you track your rides and runs via your iPhone, Android or dedicated GPS device to analyze and quantify your performance. Strava makes fitness a social experience, providing motivation and camaraderie even if you’re exercising alone. 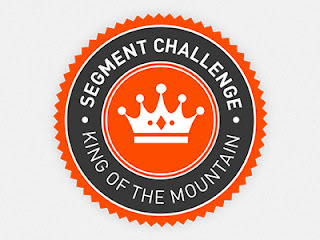 Okay, for the record Strava was a mighty blow to my ego and is a daily slap in the face reminder that compared to others the 'Zilla is ranking in the bottom 10% of riders on most long sustained climbs. So if your looking for Strava to be the thing that greets you in the morning like a kiss from your loyal and noble Labrador dog....ehh, you better keep on looking. 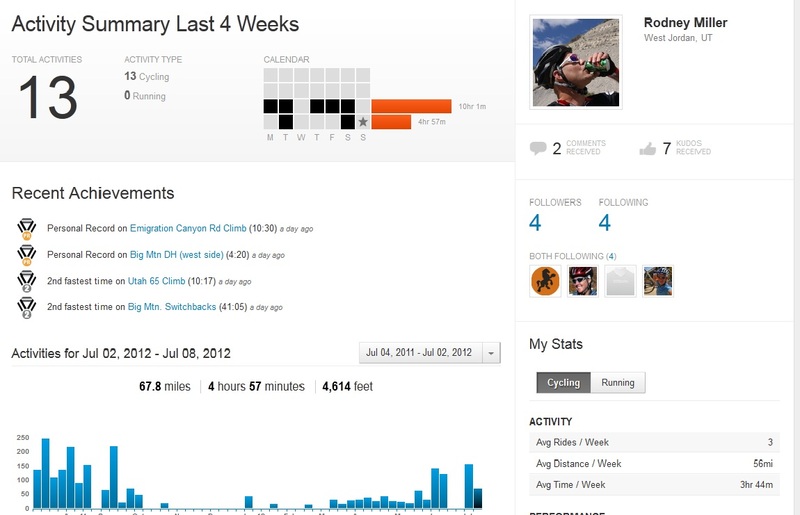 What does Strava do for me? Being a self-proclaimed intellectual (with perfect spelling and grammar - HA!) I have convinced myself that I am competing against not the full population of cyclists but rather I have talked myself into believing that I am rating myself against a higher level of athletes. Athletes who spend significant time on their bikes, who have a gps, and who put in many miles. So in my mind coming in 99th out of 100 is okay, cause those 99 people are semi pro. Right? Ya I know, but hey; this is my fantasy, not yours and this is what I choose to believe. Until I match other cyclists' intensity and frequency, I'm going to give myself a little break. It's a brilliant idea. Being able to compare your rides, or parts of your rides (segments) against anyone who has ridden the same ride, or part of it. 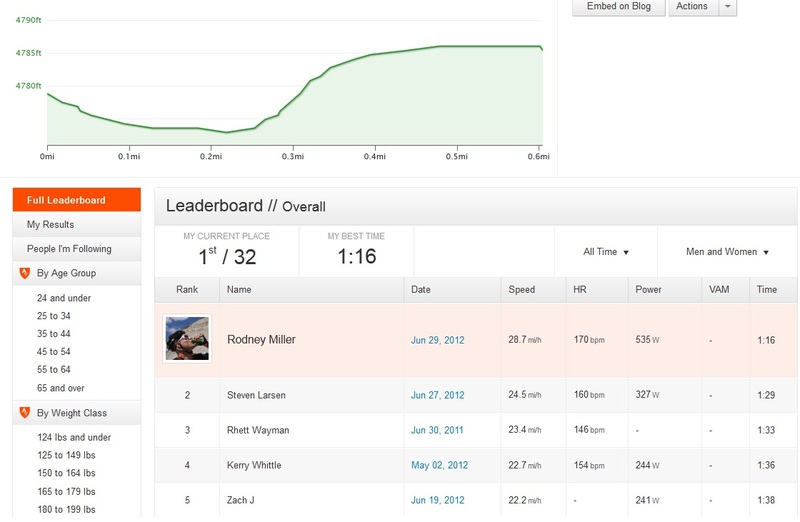 Once you get a few rides uploaded you will see how you rank on individual segments. Some of these segments may only be a half mile sprint, or hill climb, or even descent. Heck you can even create your own segment where you may think you have excelled. For example, I ride my bike to work and try to stretch it out to about 20 miles. 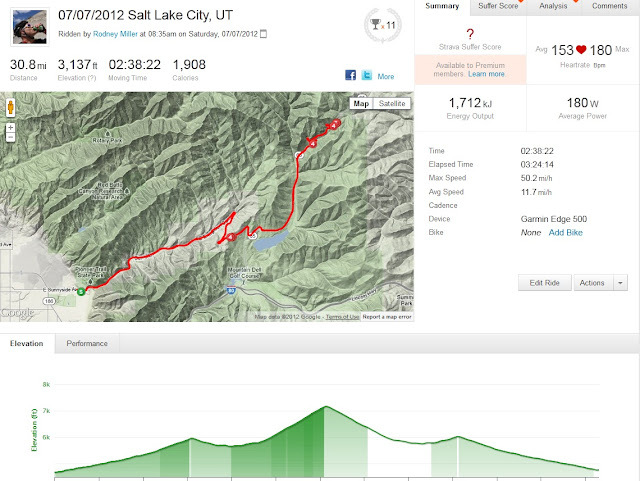 I do this ride several times a week, and sure I always try to bump my average mph up over 20 mph whenever possible. However, over time this can get monotonous. Now thanks to Strava, I find myself pushing at 100% effort for different portions of my commute. I have even altered my routes to ride more popular segments so I can compare. I tried to capture some of the features of this website in the pictures below. This is your Recent Activities Page. It will give you instant feedback and allows you to compare your recent ride to your best effort as well as others. My lonely KOM: Not much to brag about at just over a half mile, but a Perfect example, I set it and was KOM a few days later Deebs took it from me, and a few days later I took it back. This is what Strava does! Overall, I LOVE STRAVA, and I think I am going to have to test the Premium package for a month. If I had a Power-Tap to measure watts, I probably would have signed up for the package a few months ago. I may give an update report if I find significant benefits from the Premium package. For now I would gladly pay $6 bucks a month for the current version which Strava offers for free. I also think that this is a relativity new tool and through feedback and financial support, it will only get better and better. Keep riding and have fun. Oh, and try to collect a couple of KOMs. Cause it makes you feel like a boss ! I just stumbled upon this bad boy. Really Cool. For those Competitive Freaks (Hopefully most of you reading this) I have found a great tool / companion to Strava. Say you have just been knocked off the KOM, or you missed the KOM by a few seconds and you want to see exactly were it happened. 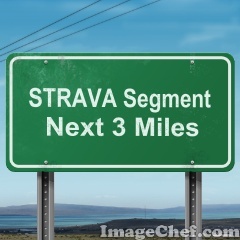 Simply copy and paste your strava segment http://app.strava.com/segments/703721 into http://raceshape.com and be amazed. In the example below I randomly picked my final leg on Rockwell Relay. I picked a guy that I knew was faster, the current KOM, myself and on slower chap and behold. It will show you how much further the KOM guy was, and where I lost the most time. 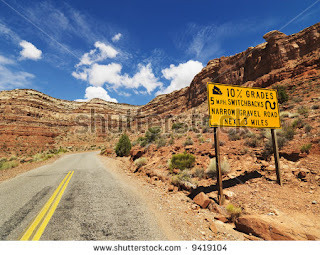 In my example it shows my weakness of climbing but then I gained back on the descents. Perfect tool to analyze your ride one step further. Hey Rodney, great write up. You should have mentioned the powertap and suffer score, two of my more favorite benefits. Your find on raceshape is amazing, just the perfect tool. Nicely put. My rides have definitely changed now that I know someone (Strava and the thousands in its community) is always watching. Like you said, it's a double edged sword, gotta be careful with it. You forgot to mention the cyber-stalk aspect. You can follow other riders/runners. Especially useful if you're training with someone for an upcoming event. You don't have to check in to see if they are putting in the miles, Strava will tell (on) you. I've loved it too. And yeah, if you wait till after you've showered to load your stats you're probably never going to really 'get' this service. Thanks for putting in words what I've been thinking. This definitely deserved its own blog entry. 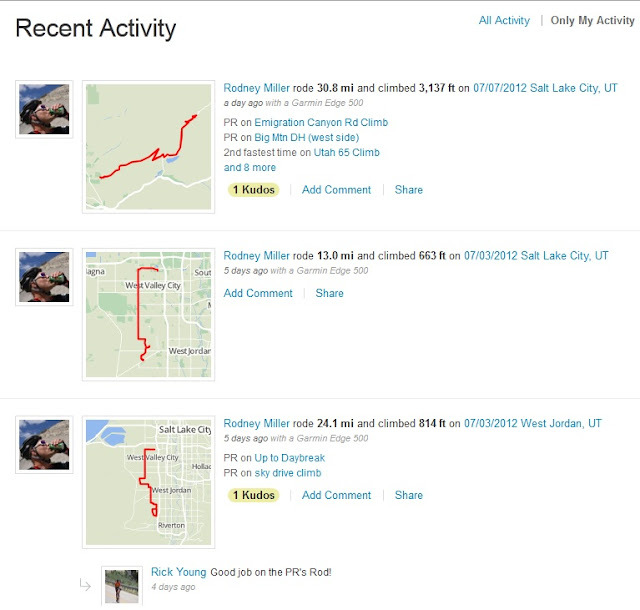 I guess I'm one of the few Strava-hatas. People who think competing can (or should) be done anonymously, online, know nothing about competition. It comes with strategy, with listening to how hard the guy on your wheel is breathing. It comes to knowing when he has 10% left; and when there's nothing left. If you wanna compete, then compete, dammit. Don't go out and endanger pedestrians and recreational riders so you can be some anonymous dickhead hero. If you must compete, ride safely then just go to a site like digitalepo.com and tweak your ride faster (it's great fun for exploding the heads of your ultracompetitive friends).